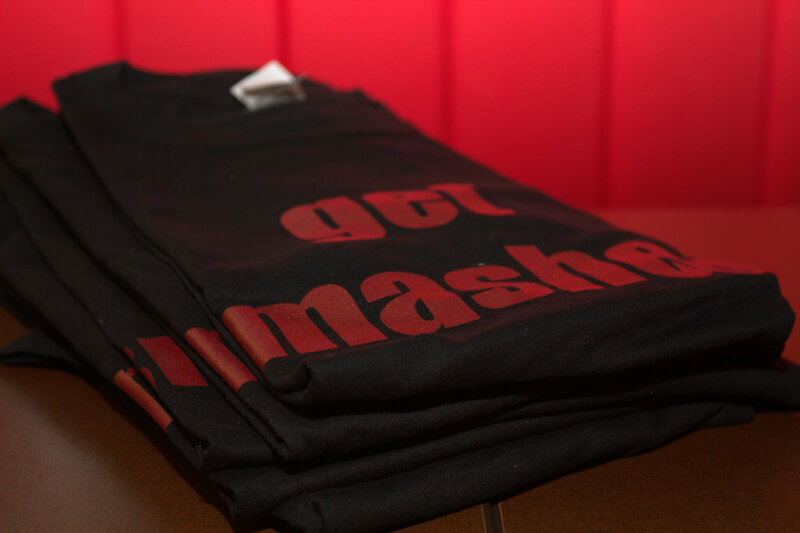 Smashburger is a nationwide “fast casual” burger chain in the United States. They get their “smashburger” name by the way they cook their hamburgers on the grill. 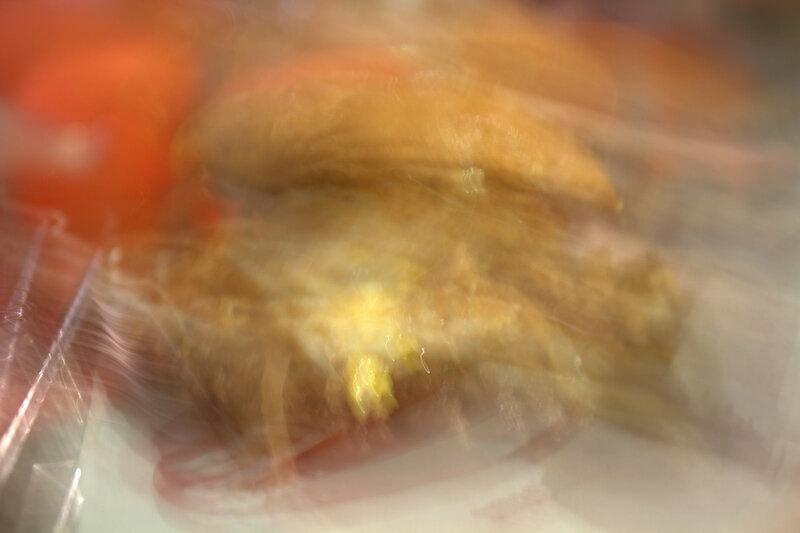 As you’ll see in the exclusive behind the scenes “making of the burger” video below (when I get my video editing software to cooperate :)) they start with a ball of an 80/20 blend of fresh Angus beef, throw it on the grill and then they literally smash it with their unique patty smasher that traps in the burgers juices. Through the power of Twitter (thanks @yetanothersusan), I heard that Smashburger (@smashburgersac) was having a contest to invite local residents to try its Vegas local burger creation: the Sin City Burger. I, along with other local burger lovers, got selected to try the burger, free of charge at one of their VIP parties. When I was chosen, I asked if I could get some burger footage while I’m there and they were kind enough to grant me behind the scenes access! 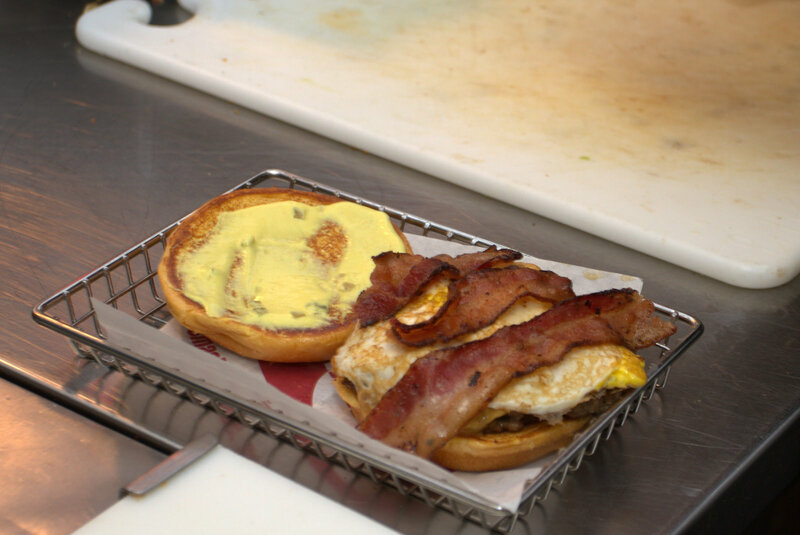 Each Smashburger location has a special burger that has a regional flare to it. The Sacramento Smashburger has the Nor Cal burger with bacon and blue cheese, and Las Vegas has the Sin City burger. 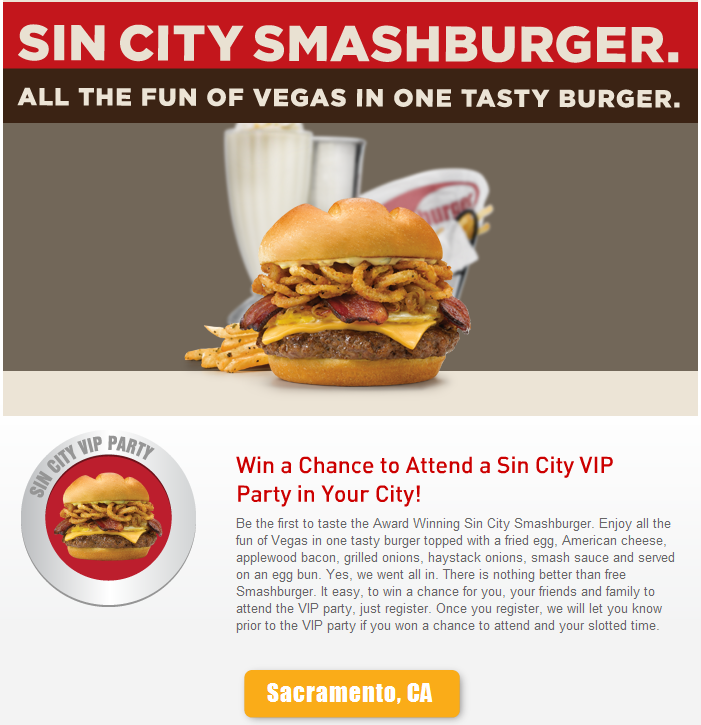 Because of the popularity of the Sin City cheeseburger, Smashburger took it on the road to show it off in other cities. Let’s take this one from top to bottom. 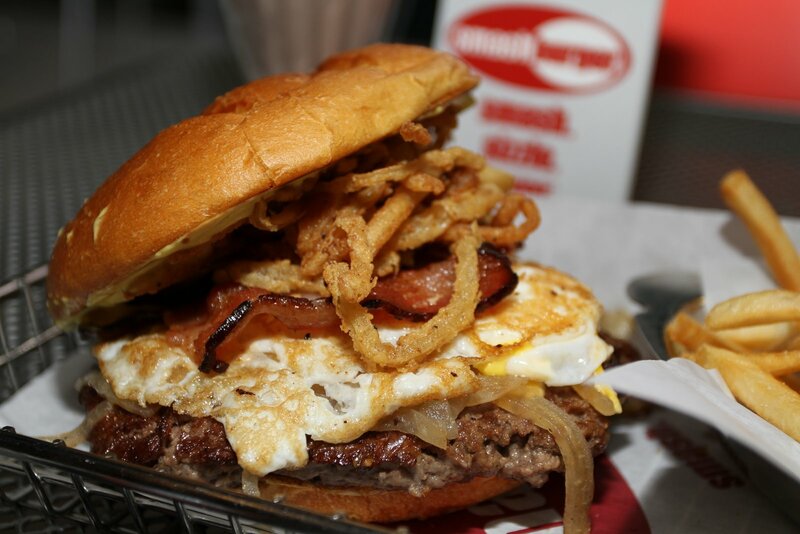 The Sin City Smashburger is held together by an egg bun which is specially made for Smashburger at a bakery in Chicago. They slather the top bun with their signature Smash sauce (a mayo, mustard, relishy blend). This burger holder held its own by staying intact as I tore through my half pound cheeseburger. 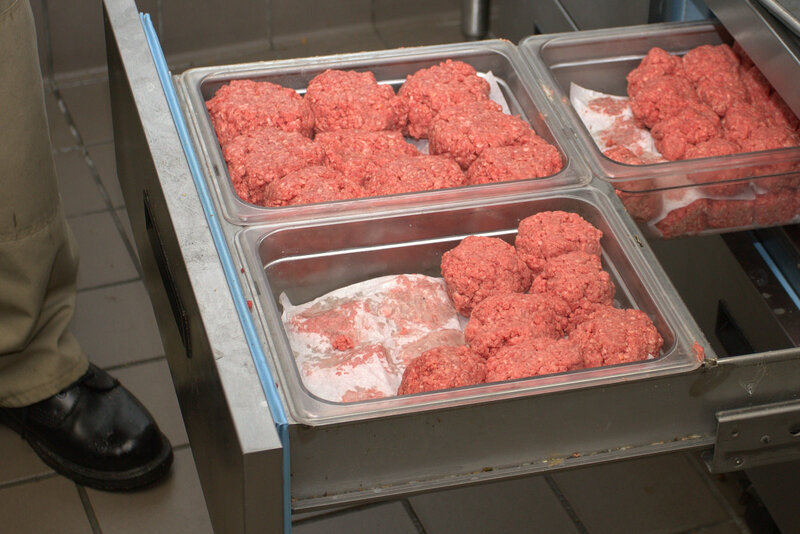 The burger comes in two sizes, the regular 1/3 pound size, and the Big Smash half pound size. 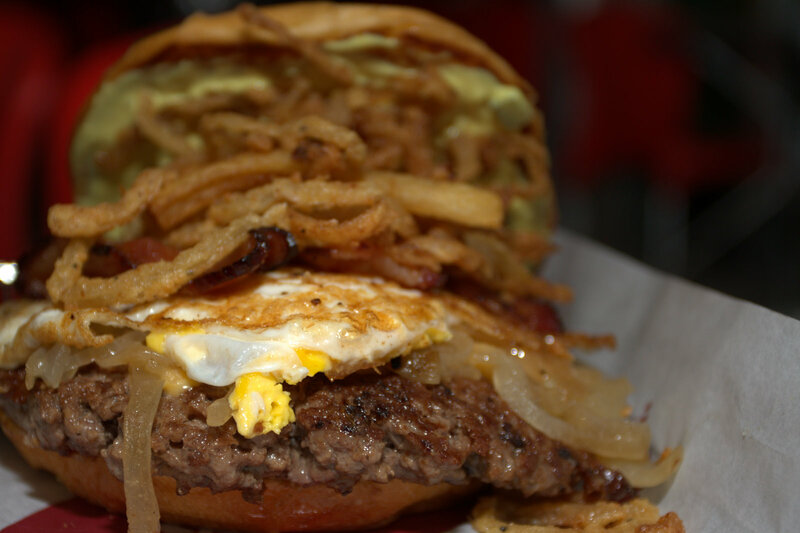 It comes topped with a fried egg, applewood smoked bacon and haystack onions. I’m totally a sucker for a good bacon cheeseburger with fried egg. 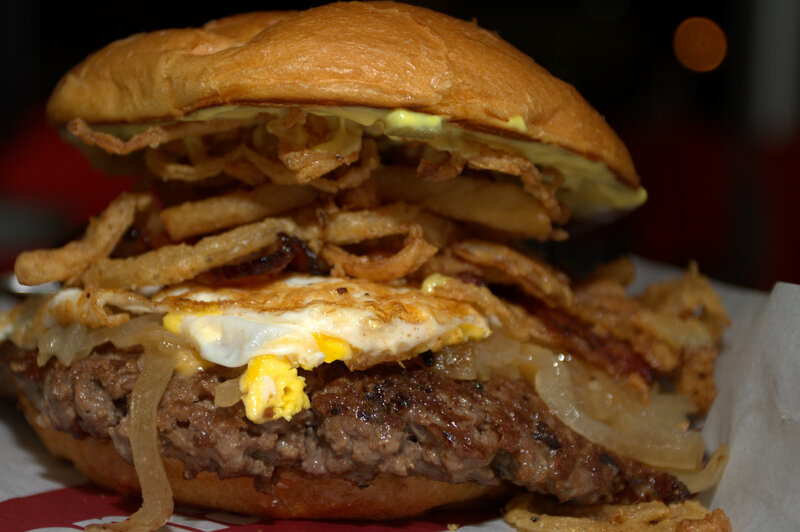 In fact, even before I knew the Sin City burger existed, I always made my own custom Smashburger creation with bacon and a fried egg. They didn’t ask how I wanted the egg cooked, so I was happy that they fried the egg hard, and not over easy like I’ve had at some other places. Something about bacon and egg on a cheeseburger just makes it seem like one of those cool occasions when you get to have breakfast for dinner. I’m not sure I’m fully sold on their Smash sauce yet. When I usually order my custom Smashburger, I usually add something a little spicier like their spicy chipotle sauce, but overall the crunch of the haystack onions and bacon went really well with the flavorful Angus beef. I have to say that I was actually very surprised when Smashburger first came to Sacramento. I wasn’t expecting a “chain burger” to be so good. In fact, I had to go back a few more times to make sure I didn’t get a fluke burger on my first trip. Smashburger gets extra B factor points for fast service and a consistently tasty burger experience. As a burger blogger, I have to admit I feel a little weird in putting a franchise burger chain’s burger as one of the top burgers in Sacramento. As I mentioned earlier in the review, the burger I ate on this trip was free as part of a promotion this store was running, but I’ve paid for my fair share of Smashburgers in the past, and I would have written the same about any of the previous cheeseburgers I’ve tried there. Great review!! I haven’t tried the Sin City Smashburger yet (definitely want to now), but I love the other burgers I’ve tried! Their sweet potato fries are also very good, and I think I prefer them over their other well-known Smashfries. 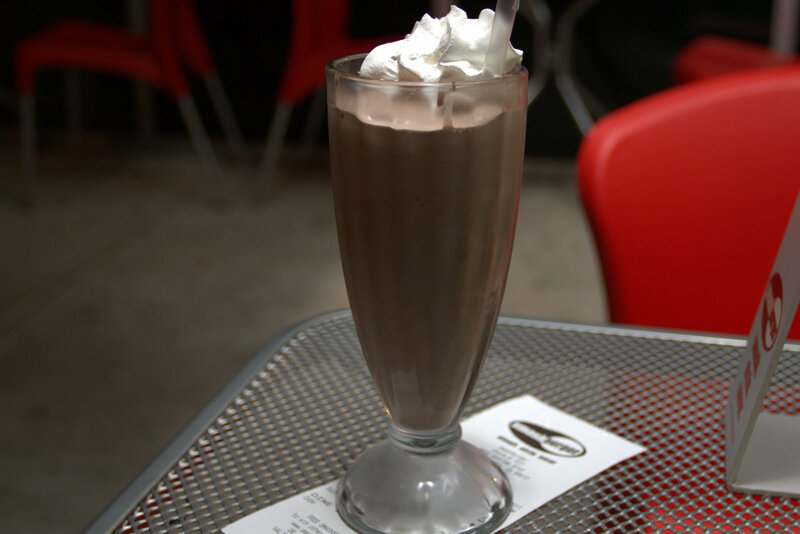 The specialty shakes, like the Haagen Dazs Butterfinger, are great too! You really can’t go wrong with a trip to Smashburger! Thanks for the feedback! I’m a big fan of their shakes as well…I love that they use quality ice cream in them! I’m still surprised each time I go to Smashburger by how good it is. Smashing a burger doesn’t seal any juices inside, it wrings the juices out of the meat!!! It makes me crazy when people try to tell me smashburger and 5 guys have good burgers because they do not. 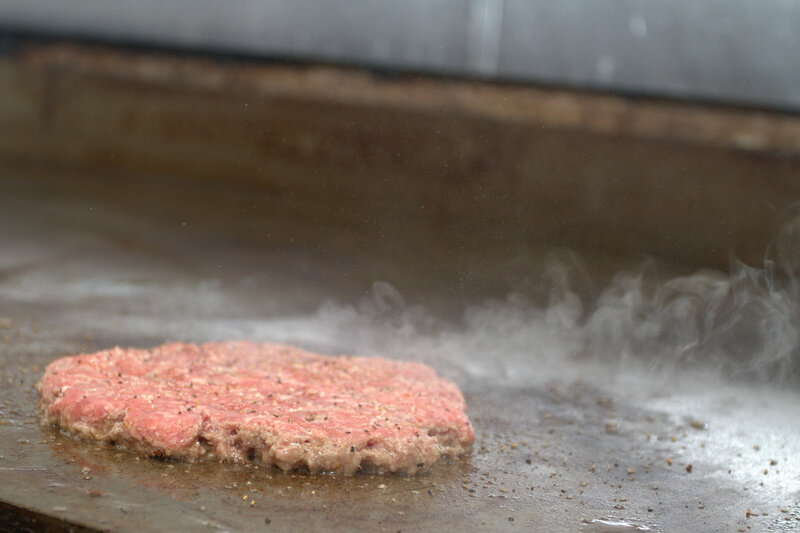 They have bland grade B meat and nothing they do will change that… If the beef doesn’t taste great, you can’t make a great burger with it. And those of us with actual taste buds hate it when the rest of you clowns without taste buds try to pretend that you do… Heck… In-and-out and Wendy’s have better meat than Smashburger. Every single Smashburger I’ve had has been super juicy. 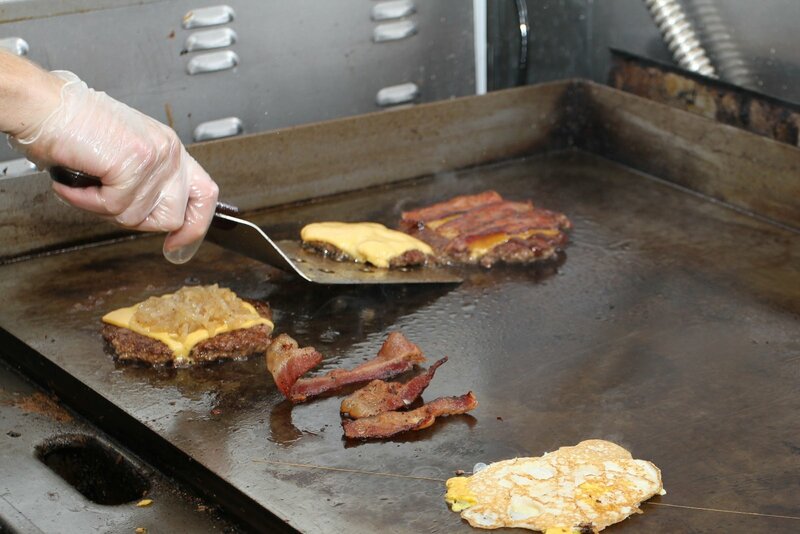 If you actually watch how they make the burgers, you can see how the juice gets sealed inside and not smashed out. They are definitely not using B grade meat. They are using 100% Angus Beef. For a fast food burger (which is never going to be cooked medium rare), it’s honestly one of the best I’ve tried. Personally, it’s way better than Wendy’s, Mc Donald’s, Five Guys, etc. Well Thank you for the reply, I still disagree 100% on the smashburger thing, but as I said, I have only tried Elk Grove twice and have not eaten at any of the others… But It was bland tasting beef and it was dry both times… Taste is one thing, but dry is not subjective to personal taste. I will give the one on Sunrise a shot (one of these days) and see if they are using a different beef and can bend the laws of science to somehow keep juices in meat by squeezing them out. (But I’m not gonna hold my breath on that one) because even after searing a meat, smashing it will drive out juices that will never be recovered… There is a reason we let a piece of meat rest (to redistribute juices) after cooking it. The General Store (Formerly the Elk Grove Brewery) is pretty good. 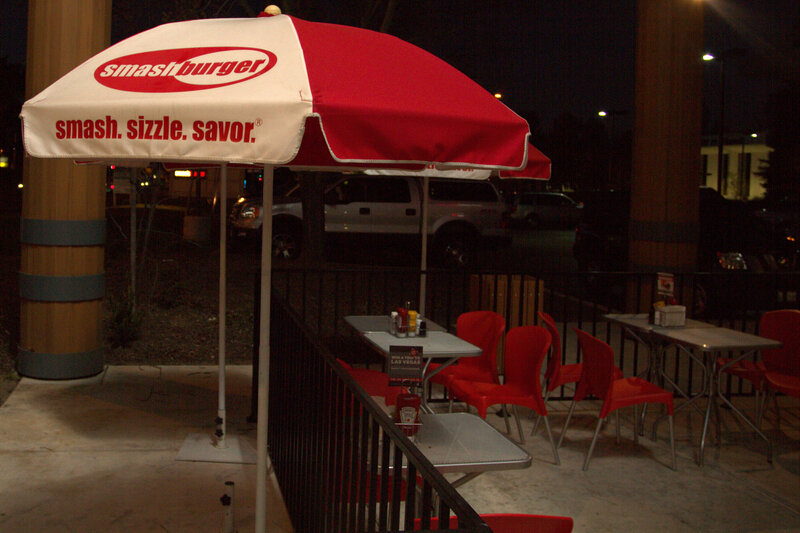 Overall, burgerjunkies has done a great job of hitting most of the really good burgers in Sac… I was just really shocked that you guys found smashburger to be palatable… You might as well of tried to tell me Burger King was really good… LOL!!! 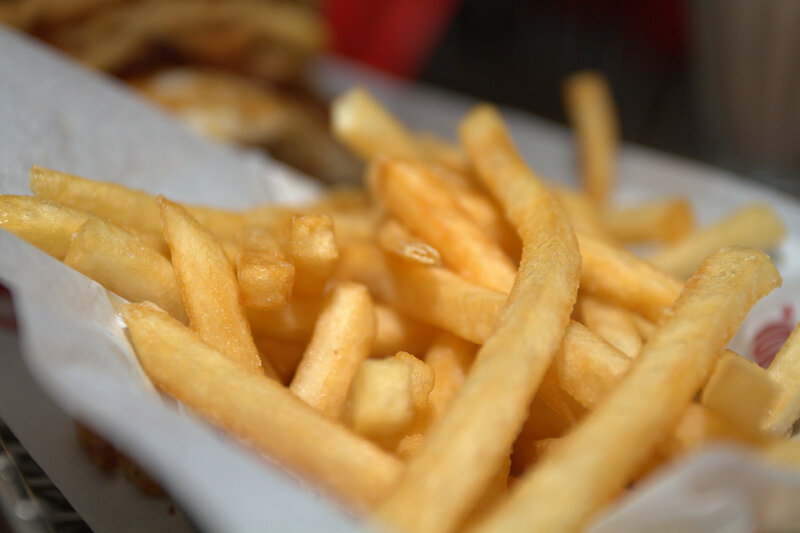 If you click around the blog, you’ll see that I’ve reviewd Fords, General Store, the Ella burger and several others around the Sacramento area. Ford’s used to be my favorite, but it’s been hit and miss lately. Ella’s is definitely one of my favorites downtown. I reviewed Ella last year when it was under a different chef; I need to write a new review since the new chef kicked it up a notch. The smashburger review is in the “fast food” category. That’s a whole different animal than the “restaurant burgers” or “fine dining” burgers I usually review. OH.. BTW… The breed of cow is nowhere near as important as the cut… Ground Beef from a bland part of a 100% Angus is not nearly as tasty as Ground Beef from a tasty part of a 100% Hereford… Aging plays a part in developing flavor, but lets face it, ground beef is generally all the small scraps, blended together. So Smashburger’s claim of having ground Angus only holds water with the ignorant. In reality, it doesn’t mean anything at all to someone who educated about beef. I don’t give a dang about what breed the cow is, what I do care about is the flavor and texture. Angus is nothing more than a buzzword for the ignorant masses… On my more costly cuts of meat, I do like to know if it is dry aged and for how long, but I still don’t care about the breed. I do think the breed of cow and how it was raised play an important part in the beef’s flavor. Not to get into the whole American Kobe/Wagyu/yet-another-buzzword debate, but the breeding and raising does have a direct effect. The cut is also important (although most restaurants just use ground chuck and season it). I actually prefer ground brisket or even the rib eye cut for the best burgers, but chuck usually wins in a restaurant environment because of the balance of cost/fat/flavor. I will definately be at the http://sacburgerbattle.com Rodney!!! I’m looking forward to it… I do hope they have enough bathroom accommodations considering the cause (a strong wind might help as well… LOL…J/K ). But I will definitely be there…. I’ve actually been rounding up friends to go. I ordered a bacon cheeseburger, but I received a cheeseburger without bacon. Several other customers had problems with their orders, and the employees were standing around and loudly joking about how many mistakes were made today. The manager refused to replace the the order, and instead he tossed a couple pieces of greasy cold bacon onto the half eaten cheeseburger. 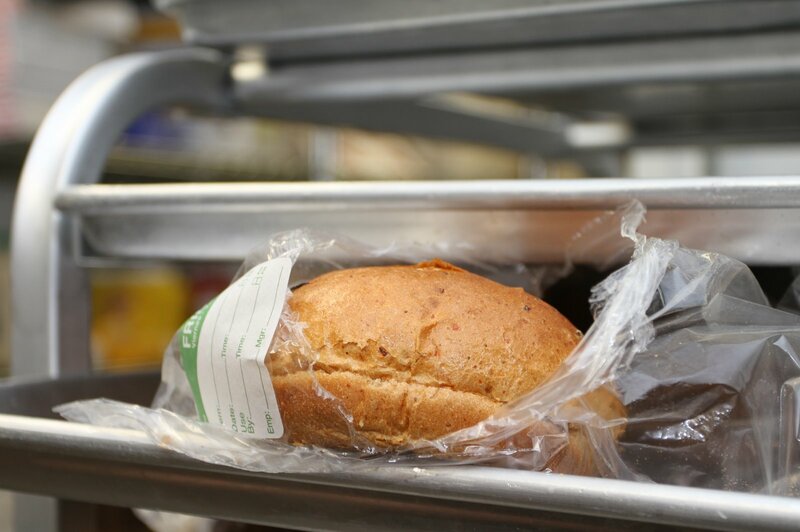 He commented that he couldn’t replace any more orders today because of all the problems. Further, he told me that if I didn’t like it, I could leave. I left. Smashburger has pretty good food, but they obviously have personnel problems. The employees have no problem cheating customers and then treating them rudely. 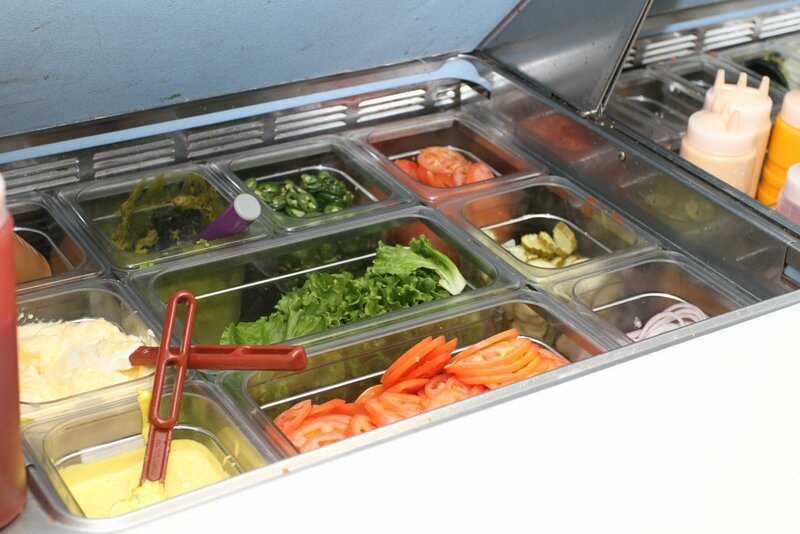 Suggest avoiding Smashburger in favor of better managed company.